As the Second World War neared its conclusion, Germany was a nation reduced to rubble: 3.6 million German homes had been destroyed leaving 7.5 million people homeless; an apocalyptic landscape of flattened cities and desolate wastelands. In May 1945 Germany surrendered, and Britain, America, Soviet Russia and France set about rebuilding their zones of occupation. Most urgent for the Allies in this divided, defeated country were food, water and sanitation, but from the start they were anxious to provide for the minds as well as the physical needs of the German people. Reconstruction was to be cultural as well as practical: denazification and re-education would be key to future peace and the arts crucial in modelling alternative, less militaristic, ways of life. Germany was to be reborn; its citizens as well as its cities were to be reconstructed; the mindset of the Third Reich was to be obliterated. When, later that year, twenty-two senior Nazis were put in the dock at Nuremberg, writers and artists including Rebecca West, Evelyn Waugh, John Dos Passos and Laura Knight were there to tell the world about a trial intended to ensure that tyrannous dictators could never again enslave the people of Europe. And over the next four years, many of the foremost writers and filmmakers of their generation were dispatched by Britain and America to help rebuild the country their governments had spent years bombing. Among them, Ernest Hemingway, Martha Gellhorn, Marlene Dietrich, George Orwell, Lee Miller, W.H. Auden, Stephen Spender, Billy Wilder and Humphrey Jennings. 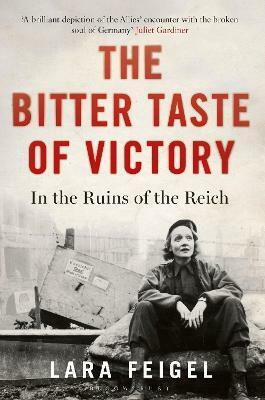 The Bitter Taste of Victory traces the experiences of these figures and through their individual stories offers an entirely fresh view of post-war Europe. Never before told, this is a brilliant, important and utterly mesmerising history of cultural transformation.